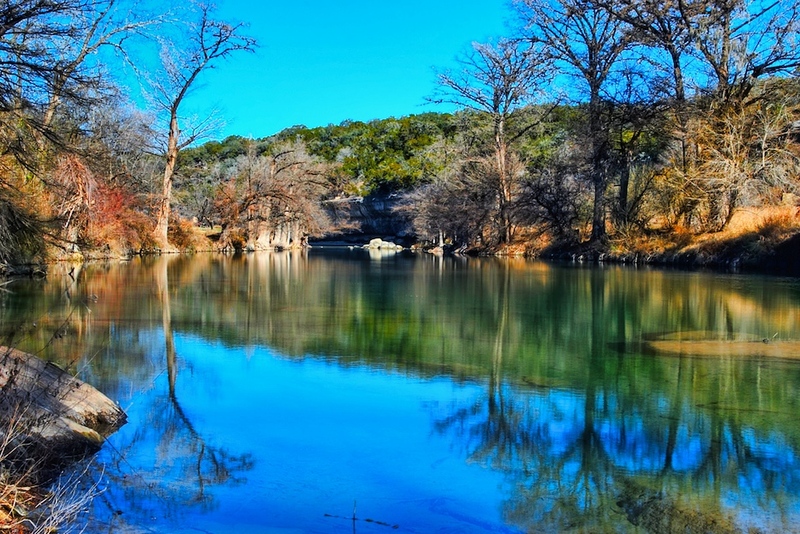 I took this shot of the Guadalupe River in the Texas Hill Country at the appropriately named Guadalupe River State Park. We were there in the depths of winter (early January to be precise), and it was empty, which is exactly how I like my landscapes to look. It is so enjoyable to walk around a beautiful place and not have to dodge tourists and other photographers. I know you can remove things like that from photos, but I tend to not mess with that sort of stuff. Apart from the obvious corrections that need to occur (such as specks of lens dust), I like to leave my photo as closely as possible to what I saw while I was there, and that is one of the great things about HDR. It really can reproduce the colors, details and textures that you see at a scene which your camera just isn't able to do in a single exposure. If you are reading this blog post, you are likely already aware of HDR photography and all that, but it not, you can read about HDR here and see my HDR Tutorial here. If you haven't tried HDR yet, what are you waiting for? It's great fun! This is a 6 exposure HDR taken at f/22, with exposures from -4 to +1. They were merged into an HDR in Photomatix, and then I made some adjustments in PSE around Curves and Contrast.